The holidays are rapidly approaching and you want to make sure that you get great gifts for all of your loved ones! You don’t want to be scrambling at the last minute to find the perfect present, so it’s good to know what you’re getting everyone in advance. So what do you get the beauty fanatic in your life? You know, the sister who is obsessed with fragrant lotions or the cousin who is addicted to nourishing face masks… What should you get them for the holidays? If you’re trying to figure it out, never fear. We’re here to help! From budget-friendly to pricier products, check out ten skincare gift sets that are currently available at Dermstore! Peter Thomas Roth has become a cult favorite when it comes to face masks. This gift set of six masks is a perfect gift for anyone who loves skincare because it gives them a mask for every skincare concern! SkinCeuticals is on the forefront of anti-aging technology, so this skincare duo is perfect for anyone who is looking to turn back the clock on aging skin. This gift set from iS Clinical has just about everything you can ask for! From a cleanser to a nourishing serum, you can solve every skincare problem with this kit! This five-piece First Aid Beauty gift set can cover an entire skincare routine. It even includes a lip balm! FOREO has changed the game when it comes to cleaning your face. This gift set includes their exclusive LUNA cleansing tool along with a mini LUNA! Vitamin C has been proven to nourish skin, protect it from free radicals, and even defy the signs of aging! This Dr. Dennis Gross kit includes various products all containing Vitamin C! 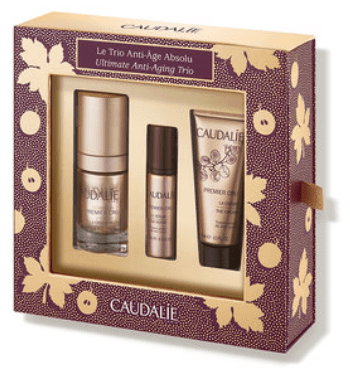 This gift set from Caudalie contains three of their best-selling anti-aging products in a beautiful giftbox! Jack Black is currently dominating the men’s skincare industry so this Jack of All Trades gift set is perfect for the guy in your life who loves grooming. Collagen is essential when it comes to having youthful, radiant skin. 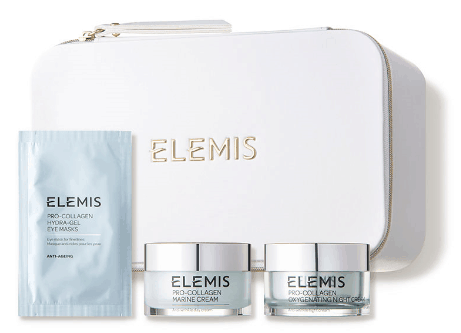 This three-piece gift set from Elemis is perfect for anyone looking to take years off their appearance! Eye masks are all the rage lately, as they can brighten the skin around your eyes and even smooth crow’s feet. This set of 12 from Erno Laszio will make any beauty fanatic very happy!